« Asaram Bapu’s sixth bail plea rejected! The article below is interesting for two reasons: it encourages “participation” (donations) and, only 150 people showed up for the annual event, out of tens of thousands alumni at the college. This is how vastly the engagement in Sai Baba institutions has diminished, the reasons being many and especially the many unresolved court actions against Sai Baba bodies and representatives, all of which seem to have been bought off with bribes in the corrupt tradition of Sai Baba himself (see testimonial evidence). This entry was posted on January 24, 2016 at 4:53 pm	and is filed under Sathya Sai Baba. 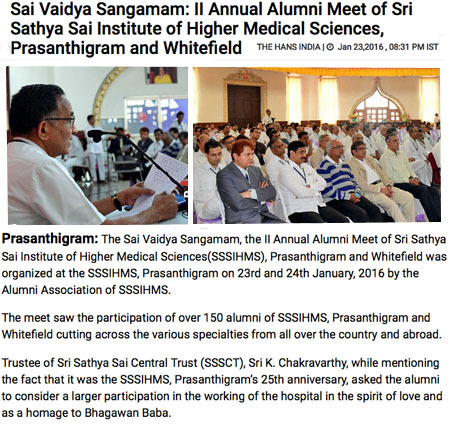 Tagged: Sai Vadya Sangamam, Sri Sathya Sai Institute of Higher Medical Sciences. You can follow any responses to this entry through the RSS 2.0 feed. You can leave a response, or trackback from your own site.